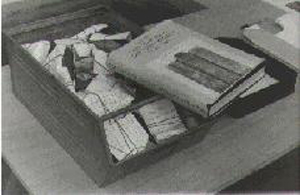 Thought Stones Collection [Kassel 1993] With permission from the local public schools,Horst Hoheisel visited the classrooms of Kassel with a book, a stone, and a piece of paper. The book was a copy of Namen und Schicksale der Juden Kassels [The Name and Fates of Kassel’s Jews]. In his classroom visits, Hoheisel would tell students the story of Kassel’s vanished Jewish community, how they had once thrived there, lived in the very houses where these school-children now lived, how they had sat at these same classroom desks. He then asked all the children who knew any Jews to raise their hands. When no hand appeared, Hoheisel would read the story of one of Kassel’s deported Jews from his memory book. At the end of his reading, Hoheisel invited each of the students to research the life one of Kassel’s deported Jews: where they had lived and how, who were their families, how old they were, what they had looked like. He asked them to visit formerly Jewish neighborhoods and get to know the German neighbors of Kassel’s deported Jews. After this, students were asked to write short narratives describing the lives and deaths of their subjects, wrap these narratives around cobblestones and deposit them in one of the archival bins the artist had provided every school. After several dozen such classroom visits, the bins had begun to overflow and new ones were furnished. In time, all of these bins were transported to Kassel’s Hauptbahnhof, where they were stacked on the rail platform whence Kassel’s Jews were deported. It is now a permanent installation, what the artist call his Denk-Stein-Sammlung [memorial stone archive].